See their photo albums at DNCB Flickr site. Twenty-one DNCBers enjoyed another gorgeous Wednesday morning wandering around a new destination, Barnston Island (BI) in Surrey. 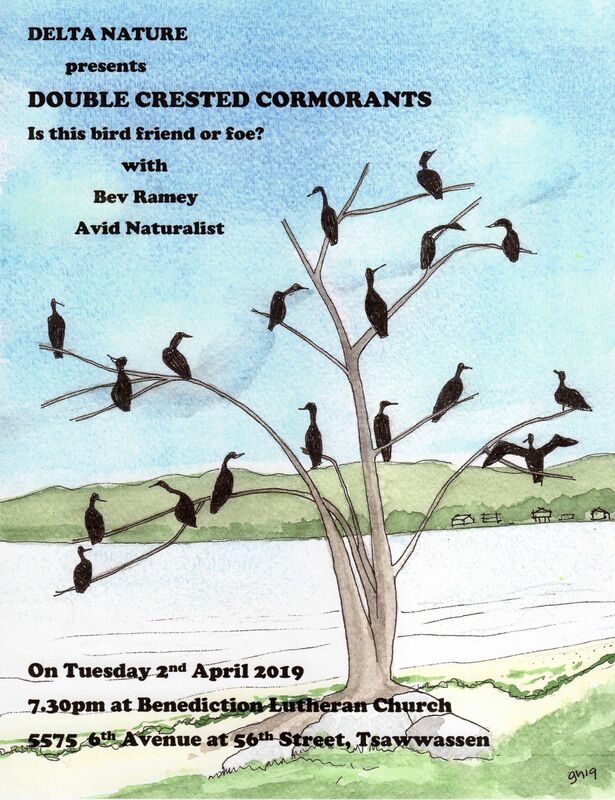 Some hi-lites included good looks at several Warbler species, nesting Ospreys, but most enjoyable was the ferry ride and a leisurely walk in a quaint, country domain with a group of like-minded nitwits. Terry, Glen, Bill, Greg, Jim, Liz, Ken, Marion and others took lots of beaut photos of the outing that you can see on our DNCB Flickr site. Nine of us (Mike drove Sheila, Kay and Hans; Gerhard had Jim and Terry; and newbie Debbie and Glen with me) left Petra’s at 7:30 a.m. We stopped at Beach Grove Park to see the nesting Great-horned Owls. We saw one adult, but Terry has some great shots taken earlier this week of both babies and the adults feeding them a Northern Flicker (see Terry’s May 5 album on our Picasa site, below Barnston Island albums). We took a leisurely drive on the new SFPR highway and arrived at the Barnston Island ferry dock at the scheduled 8:30 a.m. The masses were waiting with smiles; check out the Group Photo to see who was there. A Violet-green Sawallow was picking up nesting material from the parking lot. White Rock Al (Schulze), our outing Leader, gave a brief history of the Island and described our 10 km walk around the Island with two-car pick-ups at various stages so we didn’t have to walk the whole distance. Then we boarded the 5 minute tug-assisted Ferry to cross the Fraser. Common Mergansers and Northern Shovelers were in the river and three Swallow species, Violet-green, Tree and Barn were hawking insects over the water and shoreline bushes. As the walk started along the road, the eccentric mix of birders, talkers and walkers meant that the group spread out into several groups as we made our way past the farms (e.g. Avalon Dairy) and fields toward the Metro Vancouver Park. Lots of singing birds along the way and we had good looks at several Warblers (Wilson’s, Yellow-rumped, both Myrtle and Audubon, Orange-crowned, Common Yellowthroat). Wrens were loud too; several Bewick’s seen, and some heard Pacific and Marsh Wrens. Savannah, Song and White-crowned Sparrows were common sightings. A Pileated Woodpecker landed on a pole ahead of Al’s car, then flew back to perch on a dead tree for long enough for all the groups to see. Ken took the obligatory Group Photo at the entrance sign to the MV Park trail. A group of similarly-aged Canoeists and Kayakers entertained us with their smiles and waves as they cruised around the end of the island. From here we got shuttled for various stages along the road by Al and Richmond Bill (Big Thanks to both). While walking, most saw Killdeer, Red-tailed Hawks, Steller’s Jay, a Warbling Vireo?, Brown-headed Cowbirds, both Purple and House Finches, brilliant American Goldfinches, a feral Cat and a degenerated old Fire Truck. We took the off-road trail through the woods to the shore looking out at the Golden Ears Bridge. The Ospreys were there; one on the nest and the other on a nearby pylon. A Turkey Vulture was circling in the sky above. Approaching Noon, Al & Bill shuttled us in groups, past the First Nation homes to the ferry dock. Otto and I had an informative chat with local long-time BI resident Vic who hoped to see us return to his idyllic island. We boarded the ferry back to the mainland, basking in the sun, and lamented the end of another super DNCB outing. Al took a few zealots on a brief post tour of Surrey Bend Park before everyone headed home. Next Wednesday, May 14 we will leave Petra’s at 7:30 a.m. on a local outing to Reifel Bird Sanctuary. It’s a busy weekend for Delta Nats with our World Migratory Bird Day events on May 10 and 11. 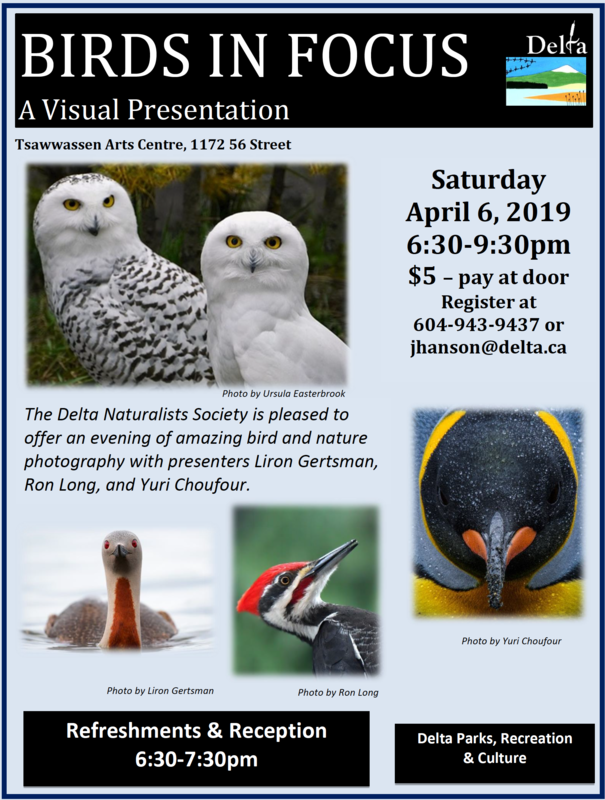 Join us Saturday evening, 6:30 p.m. to 9:45 p.m. at the Tsawwassen Arts Centre for a program of photo and art exhibits and well-known Speakers. Sunday from 12:30 p.m. to 3:30p.m. 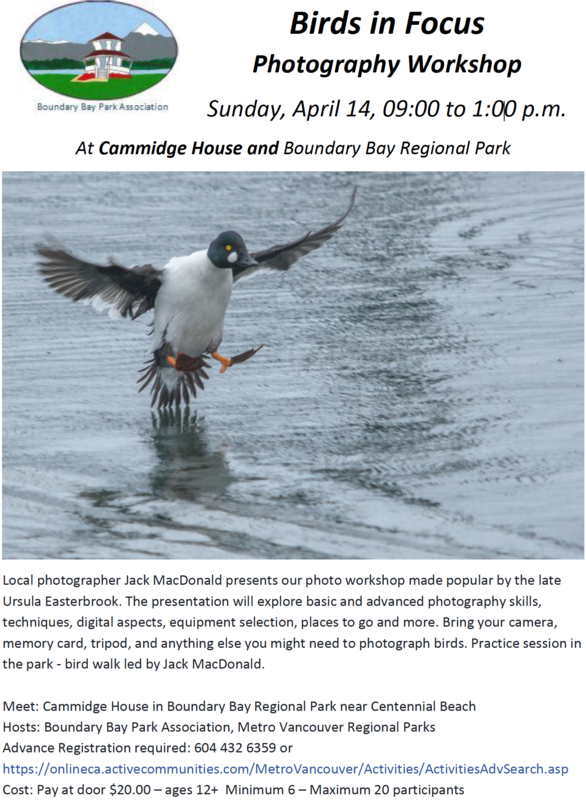 we are at Cammidge House in Boundary Bay Regional Park for Nature/Bird Walks plus interesting “Bird” Presentations. This entry was posted in Bald Eagle, Barnston Island, Great Horned Owl, Osprey, Red-tailed Hawk, Turkey Vulture. Bookmark the permalink.